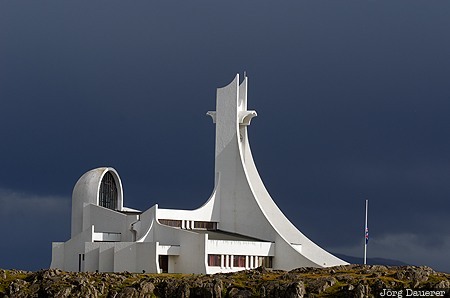 The modern concrete church of Stykkishólmur at the Snæfellsnes Peninsula below dark clouds illuminated by the low afternoon sun. Stykkishólmur is in Vesturland in the west of Iceland. This photo was taken in the afternoon of a cloudy day in September of 2013. This photo was taken with a digital camera.